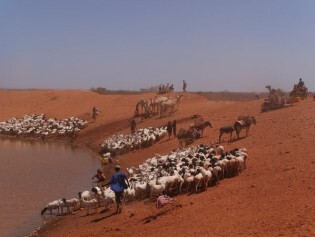 The pastoralists of Somali region make their living raising cattle, camels and goats. In the arid and drought-prone region, they are forced to move from place to place in search of pasture and watering holes for their animals. Since the violence that ensued after the ruling party won Ethiopia’s 2005 elections, this East African nation has seen little in the way of political dissent. That is, until the last few months. Despite speculation that the first anti-government protest in eight years, which was held this week in Ethiopia's capital, Addis Ababa, might signal new levels of political tolerance by the government, leaders of the political party that organised the protest say this cannot be further from the truth. Several Ethiopian publications are coming together to set up a 'press council' with the hope of easing restrictions on the media in Ethiopia. A rebel coalition in Sudan has declared war on the government less than a week after it attacked Sudanese forces. “Now there is a fully-fledged war in the new south of the north,” Yasir Arman, a leader of one of the armed groups in the alliance, told IPS, adding that the rebels now control a southern stretch of the country. For over two decades Somali Region, in eastern Ethiopia, has been devastated by a grueling insurgency. Trapped in a time warp, it has been forgotten and underdeveloped. But in the last few years, thanks to the increased security here, a five-star hotel, eco-tourism ventures and even a large abattoir are being built by the former diaspora community. For decades food security and self-sufficiency in Africa have been seen as a distant dream. The Comprehensive Africa Agriculture Development Programme, however, hopes to make it a reality, and while it may have begun with a slow start, its coordinators are confident it will produce more positive results in the coming years. Many were hoping that recent peace talks between the Ethiopian government and Ogaden rebels would signal an end to the gruelling 18-year-old conflict. The latest round of talks, however, dashed all dreams of peace between the two sides. Sitting outside her small shop, high in the mountains in the Tacueyó indigenous reserve in southwest Colombia, Liliana Alarco tries to hold back tears as she recalls the day her young son was injured.